Now available at Endless Spas is the Mineral Swim System by Maytronics. Our Island Range (which are made specifically to be compatible with salt systems ) create a relaxing, natural and healthy spa experience using magnesium-rich Dead Sea Minerals. For thousands of years, the dead sea has attracted visitors from around the world, searching to renew their skin’s vitality and youthfulness with magnesium rich mineral deposits along its shores. Now we bring an authentic Dead Sea experience to your very own spa! Imagine immersing yourself in an Endless mineral spa, your skin starts to feel softer, rejuvenated by the salts and minerals revered over the ages for their healing qualities. 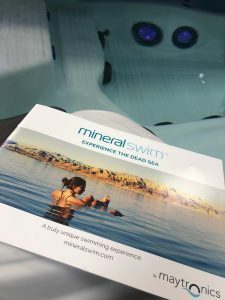 This new system is ideal for general skin hydration and helpful for skin conditions such as psoriasis and eczema, the Mineral Swim System will leave your skin feeling rejuvenated. Come and feel it yourself with our Grand Bahama Demo Spa, now featuring the Mineral Swim System.